WE are supposed to feel secure and safe with round-the-clock security at our home or office. But that confidence seems to have been shaken if we go by recent incidents. Security guards had hogged the headlines lately or just in the past two weeks. And looking objectively at the concomitant factors, it may well be just the tip of the iceberg. In a tragic bank robbery, operations officer Noazita Abu Talib, 37, was shot dead at the AmBank branch in Subang Jaya by the bank’s security guard who later fled with an undisclosed amount of cash. In another robbery, a Filipino security guard of a jewellery shop in Setapak threatened his colleagues with a pistol before walking off with a tray of gold chains. He was later nabbed while waiting to board a plane to Sabah but his girlfriend, believed to keeping a large stash of the gems, is still at large. Both security guards are reportedly from Sabah and holding fake MyKads. At home, a security guard at a Welfare Department shelter was arrested after two under-aged female residents lodged police reports, claiming he had raped them. The guard could also have raped four other under-aged girls staying at the same shelter. “We are supposed to provide a place that can give them a sense of belonging. Yet, something like this happened when they are under our care. We feel angry, betrayed and frustrated,” Welfare, Women and Family Development Minister Datuk Fatimah Abdullah was reported as saying. 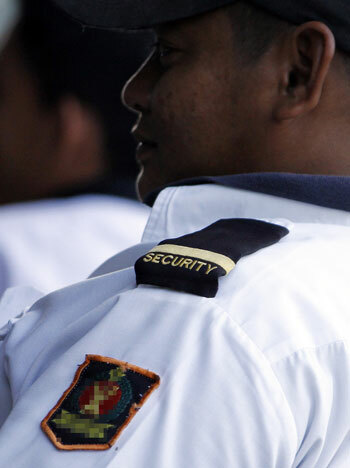 According to the Home Ministry, there are more than 700 security companies hiring over 220,000 guards in the country. The Security Services Association Malaysia (SSAM), however, gave a conflicting figure of over 280,000 – with 180,000 foreigners working “legally” as security guards and making up 53 per cent of the total employed in the profession. Illegals and locals make up the remaining 11 per cent and 36 per cent respectively. Najmuddin who also operates a security service company, said his firm only confirms the appointment of applicants after a probationary period covering training, physical and fitness assessment where a pass is compulsory, identity verification and criminal records checklist. The hired security guards will undergo constant training throughout their employment. According to Najmuddin, the successful applicants are not mere guards but, more importantly, also “trained security officers” who are to be recognised as the third line of defence after the army and the police. Such a high standard of professionalism is necessary to earn the confidence and trust of the public. While the need to hire competent and honest security personnel should not be compromised, the point is how could public angst be assuaged when weaknesses and flaws still managed to get past the verification process in the first place? SSAM has already revealed there are known illegal security guards – 11 per cent of the total number or 30,800 of them. However, another national newspaper reported on Nov 6 that there are about 150,000 of the 400,000 security guards are illegal. What are the Home Ministry and SSAM doing about these people? Also, how many of those classified as “legal” are holding their jobs with fake MyKads? Immediately after the incidents involving security guards, Home Minister Datuk Seri Dr Ahmad Zahid Hamidi said the National Registration Department will conduct a biometric examination on identification documents of all security personnel in the country. It is already bad enough to know that our security providers are not verified and cleared of criminal records before we put guns in their hands but what Zahid revealed is even more disquieting – that his ministry has received information certain companies have used security and firearms-handling licences for other purposes. He warned that permits of security companies will be withdrawn if they were found to have been engaging in activities other than those stated under the licensing conditions. He did not say how long ago he received this lead but announcing it only after the robberies does imply a seeming indifference to the issue. So, now, even companies issued with licence to hire private security guards have problems – apparently arising from the failure to strictly enforce the rules and ensure only good agencies are allowed to set up shop. Surely, it’s not wise “to mend the fold after some of the sheep have been lost” (Chinese idiom – wang yang bu lao)? Will the incidents that put a stain on the security service industry serve as a wake-up call for the Home Ministry and other authorities concerned so that the victims’ deaths at the hands of desperados masquerading as security guards will not be in vain? The time is ripe for the Home Ministry, the National Registration Department and the Police to do a thorough background check on the 280,000 security guards in the country and for the security companies themselves to verify their own representatives. Several politicians and activists in Sabah have alleged there could be as many as 1.5 million unqualified immigrants out there holding Malaysian citizenship documents issued in Sabah since the 1970’s. It is time to solve this problem festering in Sabah once and for all. There is acute urgency to look into the job description of security guards to ensure they stick to the scope of duties they are engaged to perform. It’s no secret that banks are hiring guards to transport piles of cash. Well and good if this falls within the ambit of their responsibilities but should be avoided if not contractually spelt out. Now is the time to know that not everyone in uniform with a gun can be called a trained guard. Now is the time for SSAM to maintain constant liaison with law enforcement agencies and keep close tabs on “blacklisted” employees. Lest it be overlooked, now is also the time for security bosses to reward guards who have devoted the best part of their lives to the company by treating them well so that they will not succumb to “makan gaji sahaja” syndrome but will instead go beyond the call of duty while doing their jobs. To give credit where it is due, I think I will be plainly out of line if I don’t put on record the dedication shown by the phalanx of guards in maintaining security 24/7 on the grounds of our work place. It is with all sincerity that I appreciate the diligence of the guards both in my place of stay and at our office.